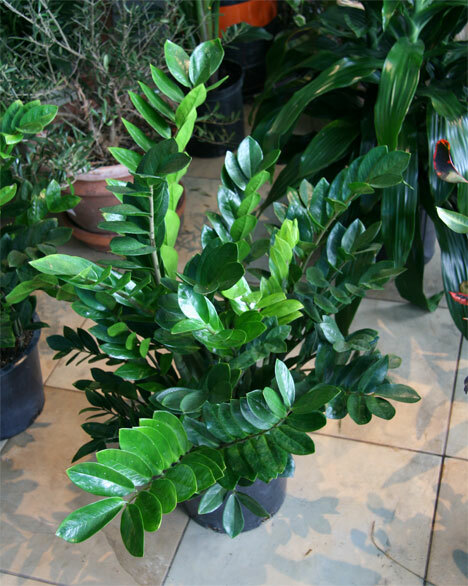 There are many plants that can thrive in about 8-10 hours of fluorescent light a day. 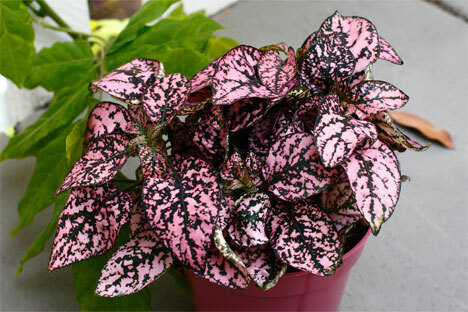 Ferns are a popular choice, especially the bird's nest, rabbit-foot and brake varieties, but for something a bit more unusual in color, consider picking up a polka-dot plant (Hypoestes Phyllastachya), also known as the freckle-face. Like ferns, these plants like a high-humidity environment, and require a bit of monitoring. The soil should be kept lightly moist at all times, and because of its affinity for humidity, the polka-dot plant likes frequent, light mistings. If this seems like too much of a hassle, you can also group the plants with other ferns, as they will all benefit from the increased humidity. If the pink spots start to fade, the plant is not getting enough lightmove it to a brighter spot on your desk or elevate it. 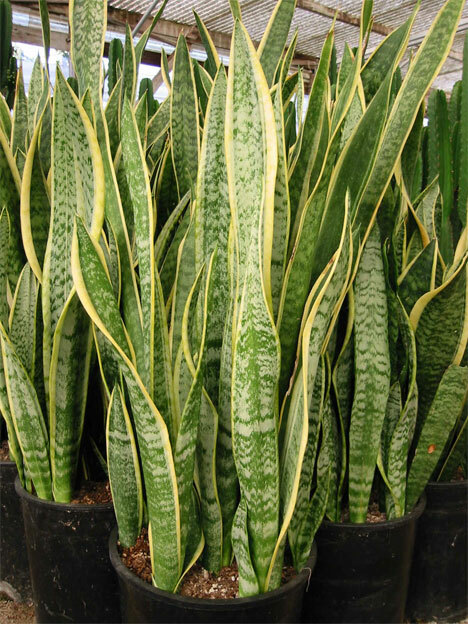 If your office is lit only dimly by natural light, and you hate turning on the overhead lights unless you absolutely have to, the Mother-In-Law's Tongue (Sansevieria trifasciata) is an excellent option. Though the young specimens often found in grocery stores appear stumpy, this plant grows to great heights, looking surreal and aquatic with its still, wavy and variegated leaves. It does splendidly in low light, and, as a member of the Agave family, needs very little watering. Soak it once every two to three weeks, letting it drain completely. A word of caution: this plant likes to be rootbound, so don't transplant it prematurely. Let it grow in the container you bought it in, setting it inside a decorative pot instead of transplanting it. This also helps with watering; take the whole thing out, put it in the sink, and let it drain completely before putting it back. 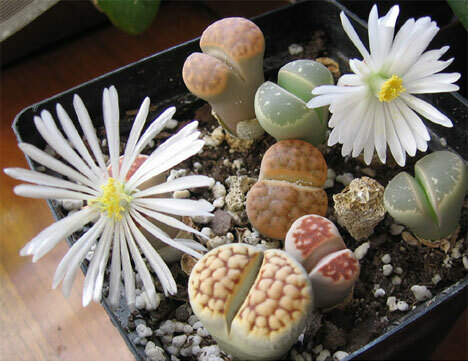 If your plant woes are caused less by lack of light and more from being absent or too busy to pay enough attention, the Living Stone (Lithops) is the plant for you. Unusual in form, these tiny succulents have two fat leaves that replace themselves every spring, producing one big flower in the fall. As long as these tiny plants get 4 hours of direct sun a day, they'll do well, requiring light watering only twice a year: in the spring after the new leaves have absorbed the old ones (but not during the transition) and in the fall, when flowers appear. 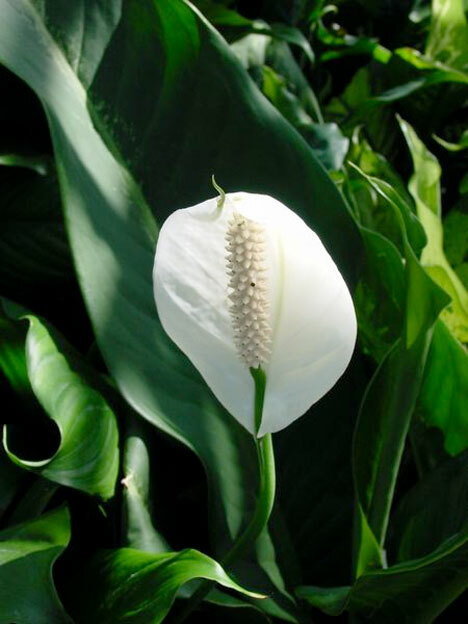 Though all plants go a long way towards improving stale, indoor air, the Peace Lily, or Spathiphyllum, is one of the best, considerably reducing formaldehyde, benzene and carbon monoxide levels. This plant also tolerates a wide range of light levels, from low to bright, as long as it's kept lightly moist at all times, making it suitable for a wide range of office spaces. Aside from the health benefits, it's also a beautiful plant, sporting large, white flowers and glossy, dark green leaves. 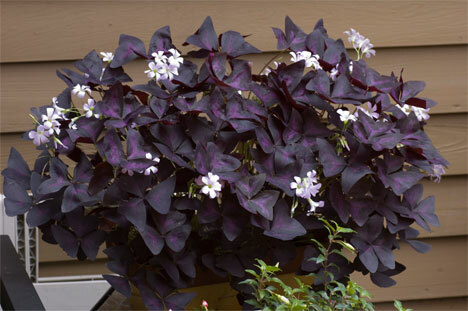 Available in green, purple and silvered varieties, Shamrocks (Oxalis regnelli, triangularis or fanny) look delicate but, believe it or not, make wonderful flowering office plants and are almost impossible to kill. They require regular (but light) watering and a moderate amount of filtered sunlight, but if you mess it up, no big deal; the plant simply goes dormant. Revive it by removing the shriveled leaves, repotting and wateringshamrocks will return in a matter of weeks. Though capable of flowering indoors year round, exposure to excessive heat and humidity will slow the production of flowers. 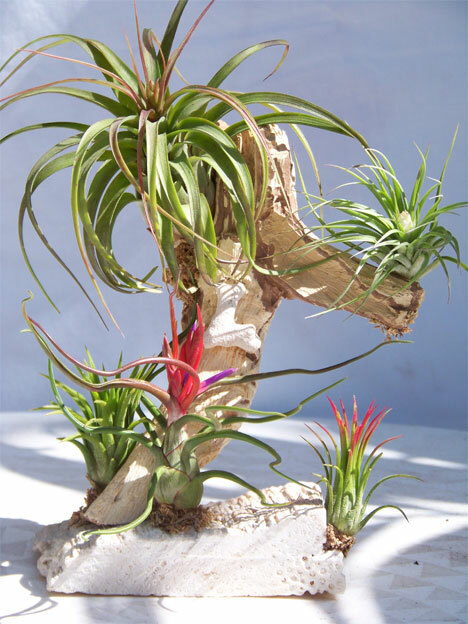 Air plants, or Tillandsia, are bromeliads without rootsall nutrients and moisture are absorbed through the leaves. That means these small wonders can live anywhere that gets bright, indirect light, making them good candidates for offices have no horizontal real estate. Hang them on the wall or nestle them on any ledge or in any crevice. Because they are rootless, these plants do require regular watering: spray twice a week until the plant is thoroughly wet, but just enough that they'll dry out in about 4 hours, and never soak the base. This can be done on a paper towel in the office bathroom without much troublethese plants are quite small. 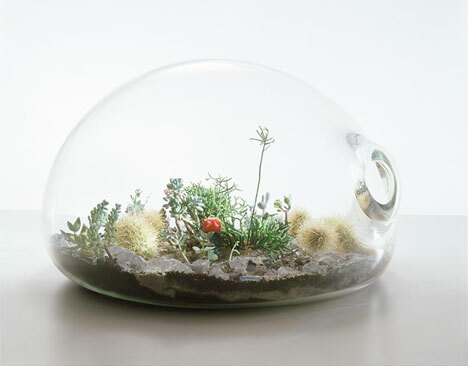 There are a number of terrariums that you can buy or make, for a wide range of light levels. When assembled properly, these mini-landscapes will take care of themselves, making them perfect for busy office life. We've been coveting all terrariums by Paula Hayes, but if you're looking for a weekend project, it's easy enough to make one on a shoestring budget. Almost anything you'd want to know can be found at the messy but comprehensive site Storm the Castle, and a nice condensed video put together by design*sponge and Sprout home lives here. 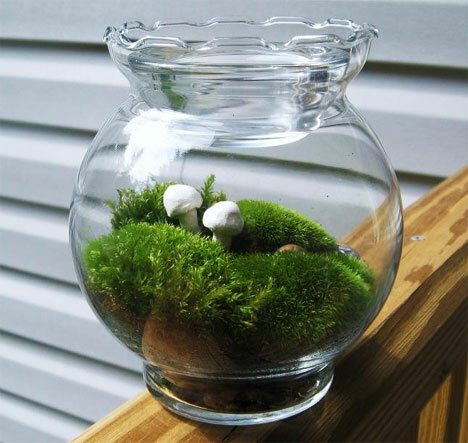 Finally, if you like the idea but don't want to spend a lot of time or money, a wide variety of small, handmade terrariums can be found on Etsy, like this small moss landscape from Warm Country Meadows. Lisa Smith is production editor for Core77. In addition to working on the site, she teaches and designs in Chicago, IL and founded the Object Design League with Caroline Linder. Her favorite plant is a Burro's Tail.